Andrew Rankin is a graduate student in literature, specializing in Mishima Yukio: no wonder then, that he has collected materials on extremes of samurai culture, though Mishima is conspicuous by his almost-total absence from this work.2 Mishima is the subtext, though, as the entire work is dominated by discourses of aesthetics and authenticity, without the complications of anthropological or historical theory, economics or historical context. 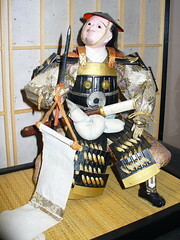 Thus you get sentences like: “Their chief aspiration, in its psychological essence, was to realize the perennial samurai fantasy of inviolable rectitude and fearless self-sacrifice culminating in sanguinary apotheosis.” (197) While Rankin acknowledges changes in practice over time, the view of samurai culture is anachronistic and stands little close scrutiny. Too bad, because even within the realm of performative aesthetics, there’s a fascinating set of problems on display here that deserve serious thought. While academics are often accused of bibliography-dumping on our younger colleagues, that Kodansha would publish a footnoted, bibliography-laden book on samurai culture without references to Eiko Ikegami, Thomas Conlan or Paul Varley — to pick the first three that I looked for and didn’t find — seems a bit haphazard. This book could be an interesting counterpoint to Ikegami, in particular, because of her focus on the tensions between control and individual self-expression around the warrior class, but without any engagement or thesis statement, this work remains frustratingly aloof. It feels incomplete. Not just because I’m a scholar and I want analysis and counterarguments. But because the book doesn’t even hold together to the standards of a popular history. Despite the example above, the prose is mostly fine, though the endless progression of stomach-cutting does get to be a bit much: there aren’t enough synonyms, though Rankin doesn’t resort to euphemisms, which is good. While there’s great value in a detailed examination of a powerful social and cultural phenomenon like this, there should be some conclusion, some cohesion, which is just lacking.